Having just crossed the Forth, plunging into the Kingdom of Fife, one is faced with a dilemma when wanting to explore the gateway to the Northern regions of Scotland; long monotonous motorway past Kinross or, a more elegant option. A long, winding coastal route flows effortlessly through the small towns and villages, each with a quaint harbour filled with piles of lobster pots and moored fishing vessels bobbing quietly in the sheltered waters. Made up of smooth A roads, starting with the A921, the journey hugs the coastline and sweeps between ruffled ploughed fields and sleepy, classically Scottish fishing villages which early on a Sunday morning are deserted and eerily quiet. 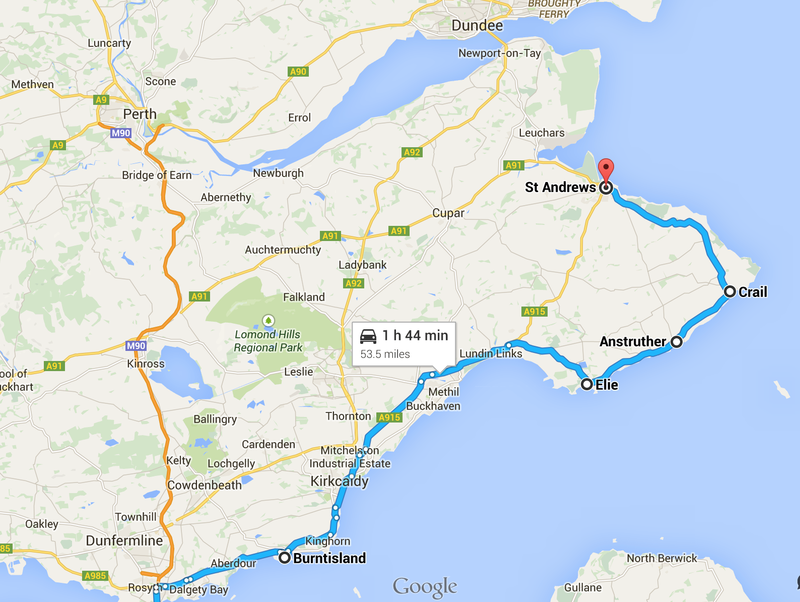 My final destination was St Andrews, with the average Joe in their Skoda Octavia taking the M90 and arriving in half the time. But with the car I had underneath me for the day, that would have been the definition of sacrilege. Having taken a thirteen year old Porsche Boxster down to Keilder a month previously, I was then presented with the chance to drive the most recent incarnation of the car that has been classed as the greatest sports car on sale since its initial release in the late 90’s. So this test was not only going to be an evolutionary evaluation of Porsche’s entry level model, but also a convenient comparison of old vs new, comparing a car that had barely been broken in with a car that had been round the block a few times, so to speak. 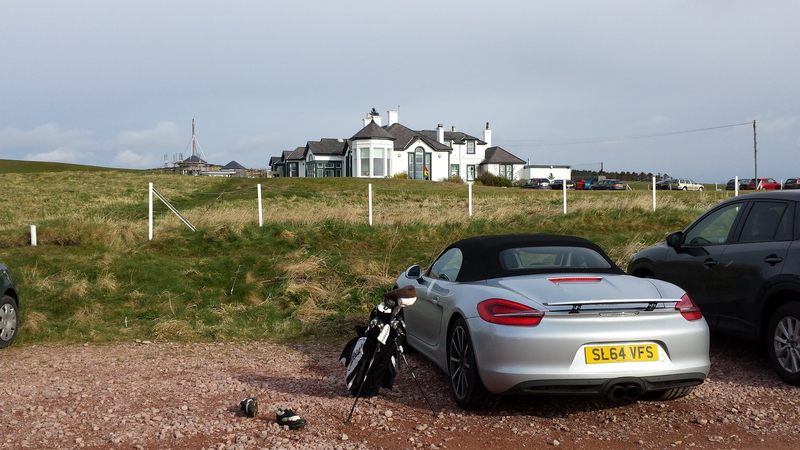 Knowing that there would be an intermission in the driving due to some golfing antics that I had planned in the private school sanctuary of Elie, I strolled out to the car in my tweeds and flat cap and discovered the first pitfall of the Porsche. With the engine slap bang between the axles, the Boxster boasts two ‘boots’, front and back. But both are barely big enough to fit a sports bag in, never mind a set of golf rackets. So they rode shotgun, giving me some metallic comfort on my journey around the outskirts of Edinburgh and over the Forth crossing. Getting off the M90 as quickly as possible, a first jaunt along the A roads of Fife led me through Kirkcaldy, after which the roads began to open out and I was able to get the top down and explore the car a bit more. As the day in Keilder had been dominated by rain and sleet, it was refreshing to be able to experience the car as it was designed to be used, although I can’t imagine Porsche envisaging a young Scot relishing the chance of opening the car up on a freezing morning in the least picturesque town in the United Kingdom. With an incredibly smooth operation, the roof was retracted in just nine seconds and can do so at speeds up to 30mph, a very handy feature in the unpredictable weather fronts that parade over Scotland’s last Kingdom. Before I talk about one of the great driving roads in the UK, let me introduce the car that I had for the weekend. 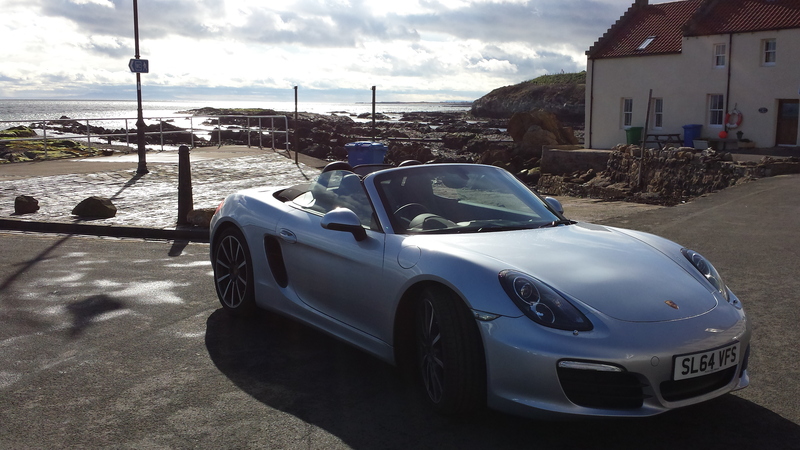 My weapon of choice was the Porsche 981 Boxster, the brand spanking new roadster from Stuttgart, a demonstrator car from the Fort Kinnaird dealership in Edinburgh. With 265 bhp from the classic Porsche 2.7 litre flat six engine, the new car has a thirty percent increase in power over the older 986. Combine that with a 35kg reduction in weight from the relative heffer from 2002 and the 981 manages to immediately push itself ahead of the older model to reach a new level of power-to-weight. With a quick blip down to second and an excitable right foot, I was soon weaving through the roads that cling to the clifftops of Fife. It doesn’t take long to get comfortable with the Boxster and also to realise just how serious a piece of kit it is, with straight line acceleration that definitely grabs your attention and parks your stomach firmly back into the seat, throwing you done the road to the next braking point. This specific car has been specced with Porsche’s sports exhaust (a £1275 option) and even at that price it is by far the most important option to have from the long list that Porsche provide. When the sports mode is activated, the exhaust really opens up and produces a much deeper and more aggressive burble than the standard exhaust system, along with hair-raising crackles and blips after engine braking. 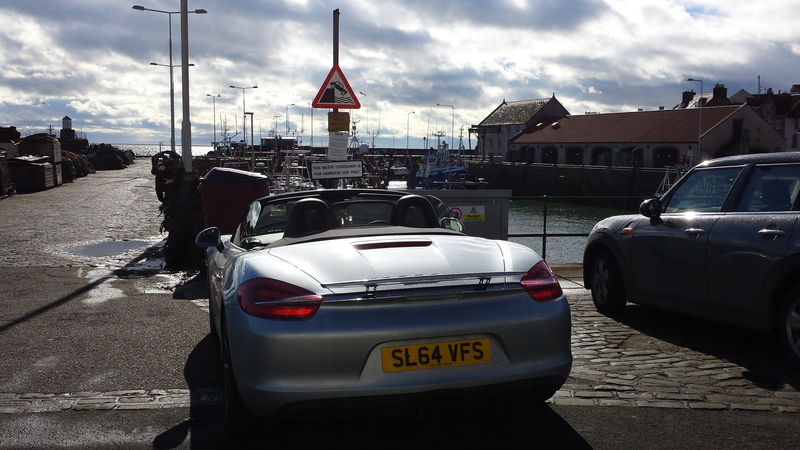 Revving the car above 4000rpm and then releasing the throttle becomes addictive, especially in a town setting where the crackles echoed between the buildings and caused every citizen of Burntisland to be roused awake by a sound like a Bengal tiger clearing its throat. With traffic starting to mount up as I ventured deeper down the coastline, I slipped my ‘Thin Lizzy’s Greatest Hits’ CD into the player and decided that I would prefer Gary Moore’s spine-tingling guitar for the rest of the saunter to Elie. Pulling into the golf club car park, I suddenly felt that for once I was turning up to an event where people would genuinely admire the vehicle I had rolled up in, with the Porsche managing to effortlessly outshine the usual golfist’s wagon: Merc C classes and Audi Q5’s to name a few. Getting out and backing away from the car, I was able to truly appreciate the outstanding design that Porsche had produced for the new model. In the past, Porsche have been ridiculed for their lack of design variations from one era of car to the next, especially in the 911 range where it is said that very little has changed in the latest few incarnations of the car. However on inspection, the new Boxster has managed to rid itself of the somewhat rounded and soft looks of the 986 and has been transformed into a much more aggressive and purposeful car despite sharing many panels with its 911 big brother. The car seems more balanced in profile, with 60mm added to the wheelbase, a larger rear end and a much sharper headlight setup which gives the car a whole new charismatic look. 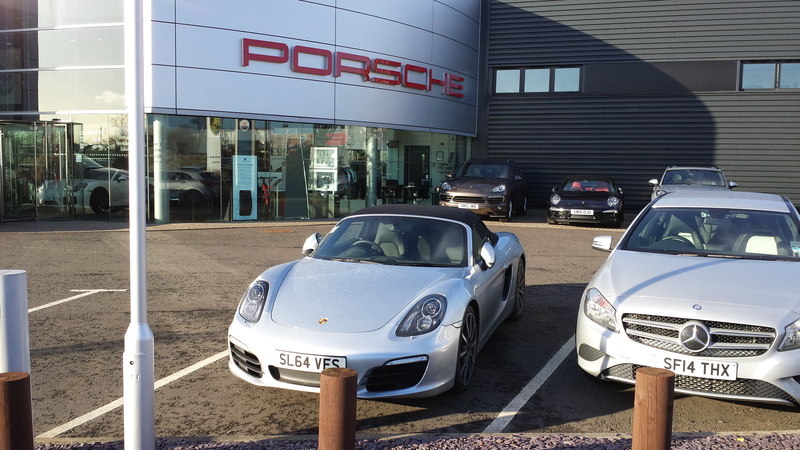 I look at the shape of the Boxster and genuinely see a baby 918 Spyder. And twist my finger and call me Nancy if you think that isn’t a visual specimen to behold. With huge twenty inch wheels and grippy low profile tyres, the wheel arches are satisfyingly filled and create a great sense of the car hugging the ground beneath it, almost as if gravity has been turned up a couple of notches and is forcing the body into a sleek and fluid profile. The 981 can now hold its own in the looks department with the rest of the Porsche range, like the girl who was as attractive as a glass of water at school but comes back from university looking like Charlize Theron. 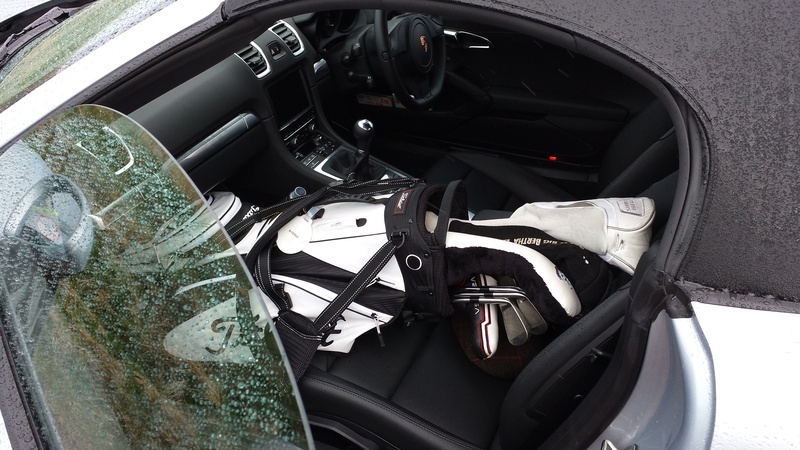 After a surprisingly successful day on the links and spending some time in the clubhouse chatting with guys who were at the age where they still think casual racism isn’t taboo in the slightest, I start up the car with the distinctive Porsche growl, with my ears melting at the sound of the sports exhaust firing into action. Leaving the confines of Elie, the proper driving began. The A917 skirts all the way round Fife, around the supposed Scottie dog snout of the region and then North up to the Home of Golf. With a jaw-dropping sea view and a mixture of cliff tops and beaches, it is truly one of the most beautiful road journeys in the British Isles. Engaging the sports mode through a button on the console, the dampers are stiffened, a valve in the exhaust opened, the rear spoiler deployed and the throttle response is quickened. In my opinion it should be reversed, only someone with chronic back trouble would opt for anything else but full aggro mode. The roads could not have been better suited to the Boxster and I could almost feel the excitement in the chassis when a string of tight bends followed by long straight strips of road could be seen ahead. As always, the mid-engined setup results in near perfect balance with even weight distribution throughout the car. With a wonderfully supple chassis, the Boxster takes corners like no other car I have ever driven, hugging the apex of the bend with absolute precision and never washing wide with understeer like many front-engined cars. The addition of electric steering to the latest Porsches has resulted in some dispute over the feel that these set ups produce, however I did not feel that any touch was being lost through the absence of a hydraulic system. If anything, the new system promotes much faster steering and therefore in my mind adds to the level of driver engagement with the road and machine, increasing the driveability of the car. The added power and loss of weight really showed in terms of outright performance in comparison with the 981’s predecessors. With a 0-60mph time of 5.8 seconds and a top speed of 164mph, the new car has seriously upped its game in terms of facts and figures and really sets a benchmark for other manufacturer’s base sports cars. It is truly staggering that those numbers are being produced by Porsche’s slowest car and it shows that the Boxster is not viewed by the German marque as a cheap, best seller afterthought. The addition of grunt was most noticeable on the small straights that litter the A917 and I can confirm that the 30-100mph time is…emmm….quick. Not that I went anywhere near that sort of speed on the empty country roads. The guy at the dealership told me. The power goes much further than the numbers would suggest, considering that 911 Carreras of old have similar statistics. And with the roof down and a vast overcast sky above you, the sense of speed is even greater, also taking into account the engine scream ramping up on the decibel chart when out in the open air. Another huge benchmark for the new Boxster has been its traction control system. The 986 caused me to have a couple of episodes that I like to call ‘arse clenchers’ down in Keilder, moments where the back end would squirm under heavy braking and gear changes and with the rear differential forcing the car into some form of Latino dance on corner entry. The traction control system on the new car was to me one of its greatest attributes. Together with the communicative steering and the unbelievable road feel through the chassis, the electronic systems governing the rear wheels become your best friend when you really want to crack on, sending power and traction wherever it is needed to constantly keep the car in shape. Such a friendly system allowed for some simply ridiculous cornering speeds on the narrow coastal roads, and yet I had complete confidence in the car to perform anything asked of it. The Boxster takes you to a special realm of driving, pushing you beyond your known limits of talent and allowing you to really feel how a car should handle in a flat out, balls to the wall situation. The car will tell you well in advance if you are being a bit of an arse and that makes for a wonderful sense of safety, even at potentially license-troubling speeds. The huge tyres gripped the Fife roads as if on rails, and if you really put some effort in and prodded the right hand pedal that little bit much, a beautifully progressive slide followed and the traction control allowed for a bit of fun before stepping in to keep the rear end from fully overtaking a gurning student in the driver’s seat. A couple of miles further down the coast, you stumble upon the small fishing town of Anstruther, world famous for its fish and chips. The harbour front was already heaving at three in the afternoon, full of punters stuffing their pale faces with forkfuls of battered haddock and deep fried, dripping chips with the intimidating, semi-predatory gulls circulating the benches outside like sharks circling a wounded porpoise. I trundled through the fishing town looking for a place to stop for some photo opportunities. It was in this fast food haven that some shortcomings of the car began to rear their ugly heads. After accidentally entering an abnormally narrow, steep one way street, I was faced with reversing back up and performing a turn in the road. Issue number one was the electronic handbrake. Why Porsche feel they need to move away from a normal lever baffles me, as the new ‘solution’ is quite simply the biggest faff known to car-loving man. Applying the handbrake is simple enough, but releasing it again is completely counter-intuitive. One has to apply the footbrake before releasing a catch under the right hand side of the steering wheel and having been used to a conventional system I was constantly being harassed by the in-car help system shouting at me to use the middle pedal if I wanted to set off again. 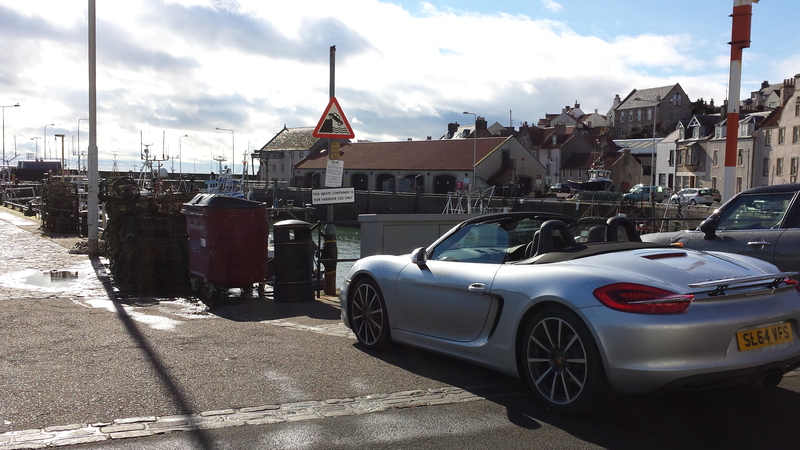 After many attempts and ample blasphemies within hearing range of a group of small school children on their day out at the beach, I managed to haul the Boxster back up the street and prepared for my three point turn. Actually, I mean seven. The combination of heavy steering at low speed and the girth of the 20 inch rims connecting to the road meant that the turning circle was something akin to a World War Two aircraft carrier. Add in a fairly meaty sports clutch and let’s just say I was perspiring a little by the time I managed to get into some sort of shape to pull away again. With the clutch stinking, my left thigh and arms twitching with strain and the low profile tyres feeling as if I was rolling over onto the bare alloy, the entire Anstruther High Street was brought to a standstill. I could see what everyone surrounding me in their Vauxhall Merivas and Kia Picantos was thinking, ‘look at that young rich pr*ck in his Porsche’. Another poor aspect is the rear visibility. Reversing with the roof up or down is practically blind so unless you have rear-view cameras in your specification or Jedi powers, it becomes a complete guessing game. I therefore had to employ the Pittenweem Harbourmaster to get me out of the historic but tight main street down by the quayside. Having made no friends in the fishing villages of Fife, I decided against stopping for a Kodak moment and pressed on towards Crail. Having been caught up in that slow manoeuvring nightmare, I promptly lit up the tyres once the road opened out again and brought some pride back to my motoring experience. To get back to the clutch, although fairly heavy and cumbersome in town, it flourishes when you are really going for it, with its preference to be dumped in a racing fashion, promoting brutal and yet satisfying shifts from the six speed manual gearbox which thankfully has a much shorter throw than previous Boxster models. There is nothing more satisfying than stringing a series of bends together, with the top down, on a bright, crisp spring afternoon, nailing every gear change and picking the perfect gear for the impending corner. With the electric steering loading up nicely with an increase in steering input, Porsche have filled the Boxster with technology that improves the driving experience, with only the most extreme purists ever needing to switch off any of the driver aids. So finally, I ended up at possibly the most coveted town in Scotland, the gem stone of Fife that only tops its deeply historical and cultural background with its spectacular location and world-renowned landmarks. Trundling in from the South side of St Andrews, it’s not long until you are circling the ruined cathedral, standing tall and proud overlooking the town below. My aim again was to stop and take some ‘artsy’ pictures with the castle and golf course featuring, but I soon realised just how busy that place is on a Sunday evening. So I ditched the sunset photoshoot for a chin wag and a catch up with Beth, an old friend from my school days. After practically forcing her into the car through a hefty guilt trip and some puppy eyes, I was able to share some Porsche power with someone whose motoring experiences had generally consisted of pottering about in one of those rancid VW Beetle reincarnations (yes, the one with the dashboard flower pot). After repeated screams of “please don’t kill me, I have an essay to write”, I managed to settle her nerves with another feature of the Boxster that has dramatically improved since the earlier models; the brakes. The vented aluminium brakes performed immaculately all day, with no tangible loss of feel or strength even during hard driving on the most demanding areas of the coastal road. Where the 986’s brake pedal would become long and would lead to having to lean fairly hard on the brake on corner entry after a while, the 981 has complete consistency in its stopping performance, letting you trust them to the very limit of your own bravery. After a cruise around the Auld Grey Toon, waving at fellow students and suitably embarrassing Beth with the sports exhaust screaming at passers-by, I decided enough was enough. As the sun began to fall in the sky, I slipped the car back out of sports mode and back into its normal, more comfortable setting for the motorway jaunt back to Edinburgh. 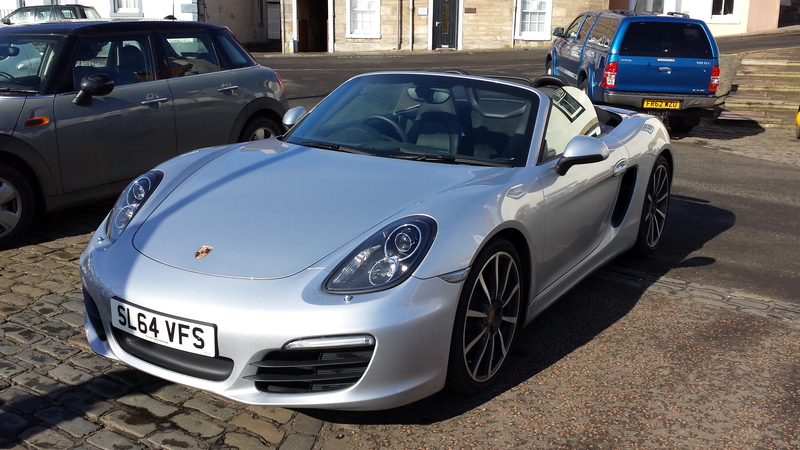 With my favourite album in the player (Time Flies by Oasis), the Boxster was more than happy to sit quietly in sixth and eat up the miles on a somewhat peaceful and thought-provoking drive past Falkland and Kinross. While Noel Gallagher was telling me not to look back in anger, I was able to look back on the car as a whole. Porsche have proved that they have poured a huge amount of their engineering nous into what is seen as their baby model, their only car that has been designed as a convertible from the outset. The Boxster has really grown up as a sports car in the past two decades, becoming a much more accomplished and talented machine, truly pushing the boundaries of what is expected of a base model sports car. The combination of a lightweight body and perfect powertrain results in a car that surpasses any statistics or numbers. It is a car that I was able to drive extremely quickly, but in a completely safe and controlled manner. In terms of learning to drive a car to its limit, the Porsche 981 allows you to fully explore its huge list of strengths and have an enormous amount of fun which is always fully accessible at any given moment. If you buy the new Boxster, despite its shortcomings in slow town driving, it is a lean, muscular, athletic, sorted roadster that is the most involving driver’s car I have ever experienced. With a Cayman test around the corner, I find it difficult to believe that the 981’s big brother will outshine the Boxster in terms of the thrill of driving. With performance similar to 911’s from a couple of generations ago, the Boxster can now completely hold its own against the rest of the automotive world, which isn’t bad for a car that was once branded as a hairdressers town runaround. So down the scissors, throw away the comb and don some driving gloves. The Boxster means business. 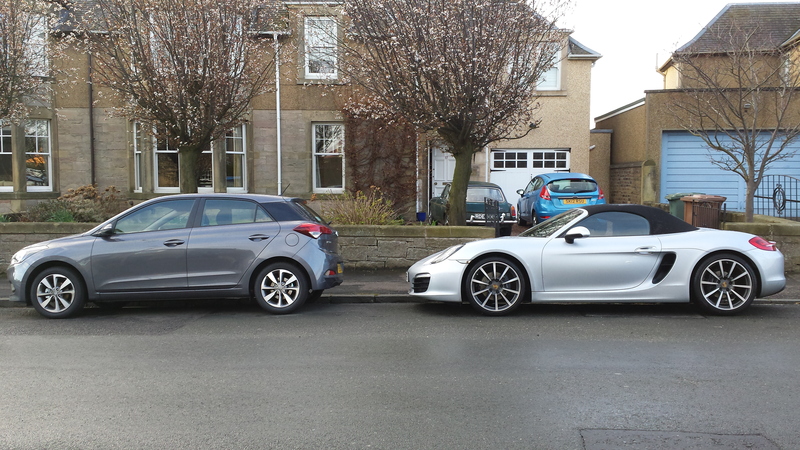 A massive thank you must be given to the Porsche Centre Edinburgh at Fort Kinnaird who are kindly helping me on my way with my automotive journalism by supplying me with such outstanding cars. They have shown me unbelievable levels of kindness and their customer service and been impeccable, even for just helping out a passionate young student. The VW Golf R – A Modern Delta Integrale?